To a large degree, we have lost the sense of season. Most of us spend the majority of our time indoors, in a climate-controlled habitat with artificial light and air-conditioning, wearing sweaters whether it is July or December. We eat grapes year-round, and lemonade is no longer just a summer treat. With a simple stroke of the pen, we can join a gym and jog whenever we want, rain or shine, without getting wet and without actually going anywhere except maybe an inch or two forward or backward on the treadmill. For the birds, however, seasons are everything. Birds conduct their lives wholly in the outdoors, where weather tells them to huddle or hustle, and where length of day tells them to stay put or fly far. Now that April has come, our winter residents are quickly replacing their drab plumage with the brilliant colors of spring. Summer residents are arriving each day, already decked out for breeding. And everyone —everyone! — is singing. 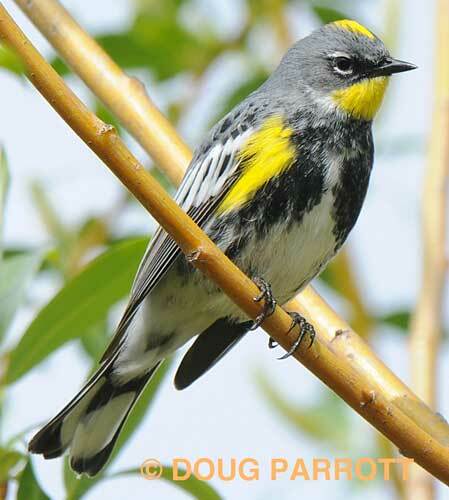 Male Yellow-rumped Warbler, about to leave for the northern taiga. In fact, the first two weeks of April are the most musical time of the year for us at the Fill. The birds who live here year-round are establishing their breeding territory, which the males do by singing. The birds who come here in spring to breed need to attract a mate as rapidly as possible, which the males do by singing. The winter birds who will soon leave us to fly north to their breeding grounds are so revved up by their hormones that the males are behaving like they already are in the Far North, where they fight by singing. I think many of them will fight and sing all the way to Alaska. Take a moment out of your busy day to stand still anywhere on the Fill’s trails and listen. The concert you hear will last only another week or two before the winter birds depart, the year-round residents settle down to brood eggs, and the summer breeders get busy raising a new family. We will still have song, of course. We have that all year round. But the symphony will never present us with so many diverse voices as we hear right now. Once the symphony disperses, it won’t return for an entire year, and we will have only our memories of this rich sound to sustain us till then. This entry was posted in Uncategorized on April 9, 2012 by constancesidles.